A north-east MP has been criticised after pictures emerged of him smiling alongside a member of a far-right Spanish party. The party, which won a number of seats in southern Spain in December, has attracted widespread controversy with pledges to abolish a 2007 “law of historical memory” which demanded the removal of Franco-era fascist symbols from public places. Its leader, Santiago Abascal, has also raged against what he calls “supremacist feminism and gender totalitarianism” and the party has complained that existing domestic violence laws are unfairly weighted against men. The Press and Journal understands that Mr Thomson met with Mr Monteros, along with Tory MP Andrew Lewer and Brexit minister Chris Heaton-Harris, on the parliamentary estate on Wednesday afternoon. A source revealed the meeting was brokered by Tory MEP Daniel Hannan – who is gauging support for Vox joining the European Conservatives and Reformists grouping of MEPs in Brussels if the party gains seats in the upcoming European elections. The group was formed at the request of David Cameron in 2009 as a Eurosceptic alternative and its members include right-wing groups from 18 European countries. An SNP source described Mr Thomson’s decision to attend the meeting as a “shocking misjudgement”. He said: “Ross Thomson is heaping yet more embarrassment on Ruth Davidson and Jackson Carlaw. “The Scottish Tory leadership must immediately distance themselves from this extreme, populist party. This meeting is symptomatic of a much wider problem in politics – the normalisation of the policies and language of the far-right. It can’t continue. A Scottish Conservative party spokesman said Mr Thomson did not endorse the views held by Vox, but the MP did retweet a picture of himself posing with Mr Monteros. 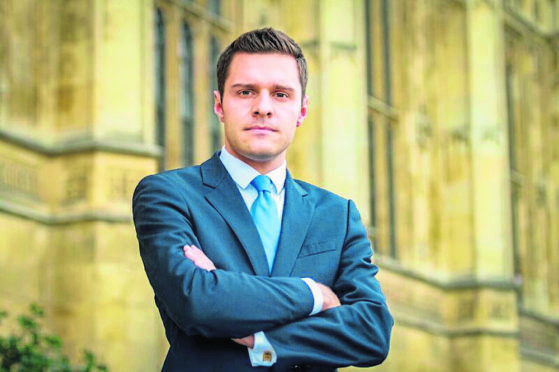 The spokesman said: “The delegation from Vox met people across Westminster – including a government minister from the Department for Exiting the European Union.